The T3 pinball design team includes primary members of the same team that brought you the famous and successful T2 pinball machine. Players earn the right to play the Rocket Propelled Grenade feature, shooting targets with a ball and cannon in the backbox. 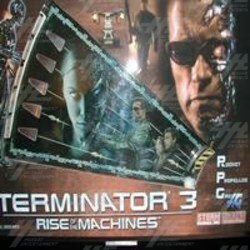 The Terminator III pinball also is being released to coincide with the release in USA of the T3 movie on 2nd July. To reserve your stock please contact our sales staff.